I can still recall the joy I felt when I landed my first freelance writing gig. Someone halfway around the world was going to pay me for my work! Sure I had a deadline to meet, but I could work at my own pace, on my own schedule, in the comfort of my home, and I would be able to accept work at my own discretion going forward. Ciao, office life. Paynote looks to spare each party from the hassles of payments, so that freelancers can be paid quickly and easily. Paynote distinguishes itself from other payment platforms right away, by doing away with processing fees. Three percent may not sound like much initially, but it adds up in a hurry. What’s more, experience has taught me that few freelancers earn enough that they don’t sweat the cents and dollars each month. Instead of nasty, surprise charges, Paynote users choose a plan that matches the amount of payments they process. Up to five “paynotes” a month is free, while unlimited “paynotes” runs $12 per month. Paynotes, you ask? Paynote facilitates bank-to-bank payments. So, money, or paynotes, can be sent to an email or phone number in a flash. 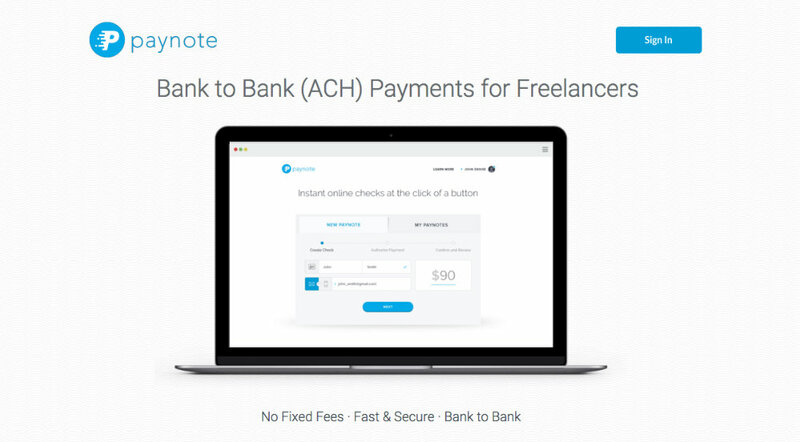 Freelancers can claim their funds – and have dough in their bank accounts without any additional transfers – with a single acceptance click. Let’s backtrack just a tad, to highlight arguably the best feature of Paynote. Instead of determining where to send invoices, how to send invoices, and all the other tedious wrangling that eats into freelancers’ time (and saps everyone’s productivity), Paynote ships payment requests via unique Paynote URLs. This means that payment requests can be sent easily through a variety of channels – in an email, open chat, or any number of apps, including Slack. Talk about convenient. Those familiar with Freshbooks, will be happy to learn that this service integrates seamlessly with the invoicing tool. However you work, whatever apps you use, Paynote wants to be there to smooth payments. Tired of forking over a percentage of fees to get paid for freelance work? Keep your banking info to yourself and get paid faster using Paynote.